Hi, I’m Dallas Alston, I work with aquaculture in Puerto Rico. Our main research is to determine the effects of aquaculture on the environment. To increase the amount of fish that are available for increased populations around the world to eat, we’re looking to grow our own fish in the ocean. Hopefully we’ll take the pressure off of native or wild fish because fish are being overfished. We went out and studied a farm which is located on an island east of Puerto Rico. 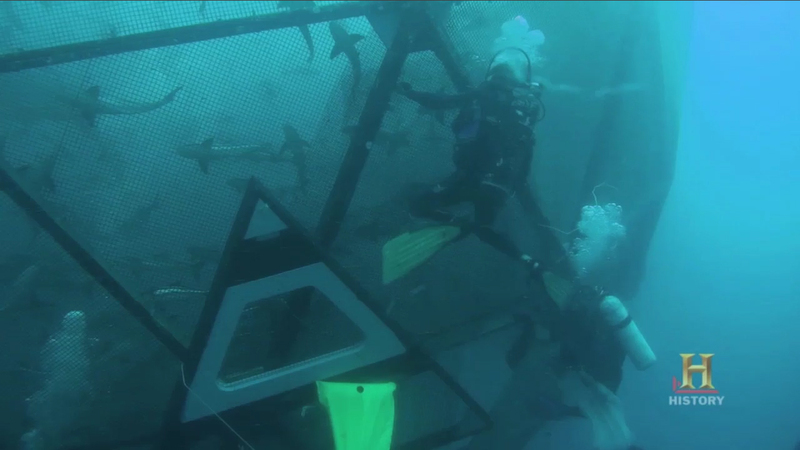 The fish farm in this case was located underwater; it was a submerged cage. We were studying the effects of feeding that cage on the environment. The owner of the farm was named Brian O’Hanlon. The farm is directed offshore here, about two miles. Our focus is cobia, but we have raised snapper here, roughly 2,500 pounds a week. We’re basically harvesting fish, and about 36 hours later the fish is delivered. Our primary market is the United States. Some of the key things that make the farm sustainable are really number one, site selection. We’re looking for flat, sandy bottoms, by doing that we are avoiding sensitive ecosystems. We need scientific work being done. You know, develop a kind of baseline understanding of what’s going on. For NOAA and other federal agencies that really want to responsibly develop the industry, they need numbers and data. This is the first time in the Caribbean that we’ve look at the effects of aquaculture on the environment. As you feed the cage, you get an increase in nutrients from the fish feed that’s possibly not eaten, but also from the fish waste. This is a source of pollution. We wanted to find out what were the effects on the environment? We took divers and sent them out in teams to go and study the water column. Se we were able to look and see at individual depths what was our nutrient content in the water. They would take water samples, but also samples off the bottom, where they use actually core samples. So what did we find? One, is a fairly strong current would take the waste out, away from the cage site. They’re not concentrated. So they’re distributed throughout the ocean, and small organisms like phytoplankton can use these nutrients to grow. But also, if you have a deep area this waste will not collect on the bottom. We quickly found that really, there were very little nutrients, very little pollution, coming out of the cages from an environmental standpoint. One of the bad things about aquaculture in general is that we are feeding fish to fish. We’re taking small fish out of the ocean, we’re making them into fish meal, and we’re feeding them to fish. One of the things we’re recommending with fish feed is that we try to switch from fish meal to plant-based fish feeds. This is a really interesting field, to come in and see if we can feed people at the same time, try to protect the environment. So it’s a win-win situation for everyone.